Even before your project starts, there are critical topics to be addressed. SophisTex can support you with gauging the scope, setting the success criteria, identifying risks and setting milestones for optimal allocation of resources and successful project kick-off. SophisTex Best Practices are documents based on several years of project experience and lessons-learned from global projects across all industries. Even though SAP standard software is extremely powerful, your business needs result in enhancements exceeding customizing. Whether you want to enhance an existing SAP standard functionality during implementation, after implementation or by building your own custom SAP solution, our Best Practices help you to leverage the optimized existing processes and drastically increase quality. Our Best Practices are grouped into several topics such as Technical ABAP Implementation, SAP PLM 7 Architecture and The Organization of Internal Development Processes. The Best Practices documents complement our offered pre-, during and post-project services. They help educate your technical staff whether it consists of internal or external team members. Additionally, SophisTex offers workshops and trainings based on our Best Practice topics. Feel the need to get a second opinion? 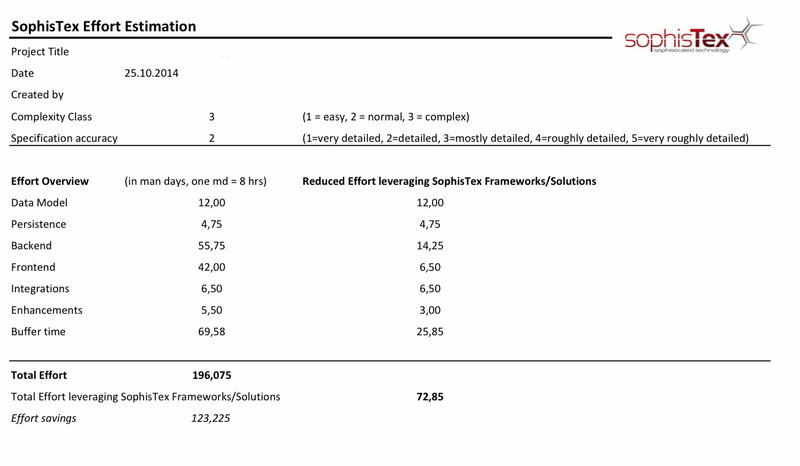 SophisTex offers very detailed and well-founded effort estimations for your SAP implementation project related to ABAP, ABAP OO, WebDynpro/FPM and SAPUI5. Depending on the available documentation, we estimate with accuracy buffer factors to give you an as detailed and exact effort estimation as possible. By using pre-defined templates, calculations based on our business independent development experience and by asking the right questions we give you just the effort estimation for safe budget planning and negotiations with your supplier at eye level. We evaluate and review your SAP PLM concepts prior to implementation, assess the technical architecture of additional developments and check your system landscape in terms of needed services, EhP versions and hardware requirements for your use-case scenario. Evaluating concepts and asking the right questions about the planned technical architecture for implementation helps you to proactively minimize potential risks with regards to time, budget and quality. Your supplier claims to be the expert in WebDynpro and FloorPlan development? They know everything about the SAP PLM architecture in classic SAPGUI and WebDynpro? Let us do the pulse-check! With us you can get the assurance that the desired skills are really available. Contact us to book your trainings and discuss further topics. Compared to other trainings offered, we center the training content based on your target-audience. Trainings can also be held on your systems to maximize applicability in daily work and upcoming projects. Trainings can be done remotely via web sessions including video and audio, in our training class-rooms located close to Walldorf, Germany or at your premises to minimize travel costs and effort for your staff.